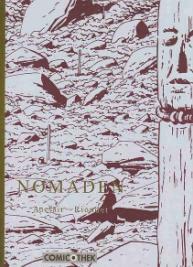 This story on a nomadic culture is located in an era before time, but remains timeless. In 1988, numbers 128-132 of the magazine (A Suivre), on a scenario of Alain Riondet, CELUI-LÀ (He) was published. In German this volume was published in two parts called Nomaden 1 and 2. An omnibus followed (Nomaden) with part of page 93 on the cover. Issues 3 and 4 were not published (yet) containing the pages of Celui-Qui-Achève. CELUI-QUI-ACHÈVE (He Who Completes/ He Who Finds The End) was created. When Claude Auclair died he had not finished the last nine pages. Claude Auclair had made scetches for three pages, which were printed in that last comic-book. Auclairs friends Jacques Tardi and Jean-Claude Mézières each drew half of what was necessary in order to finish this opus. Illustrations by Tardi and Mézières; good old friends. 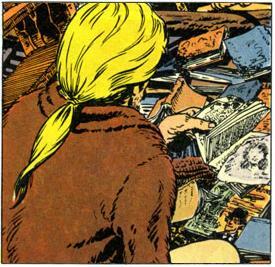 In the color-illustration we look at the pile of books belonging to Charles (Simon-adventure Clan of Centaurs, first publication in Tintin/Kuifje in 1974) and see a cover of the first printing of Adieu Brindavoine, an comic-album by Tardi.